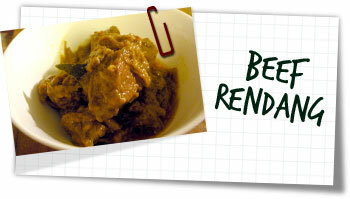 I have another recipe for rendang here which I’d made with lamb but on looking at it again I just found it quite fussy. I ate an amazing rendang at a restaurant last night. A Betawi restaurant – Betawi being an ethnic cuisine from Indonesia – and it was absolutely amazing. It looked less complicated than the last one I’d made so I hunted out a simpler recipe and gave it a try. I must say, even for such a seemingly complex dish, less is definitely more. Less hassle, more taste. Very easy. Blend together the shallots, chillies, ginger and galangal in food processor until smooth. Put this into a large pan with all the other ingredients and stir. Bring to a boil then reduce the heat to low and simmer uncovered for 2 1/2 hours stirring occasionally. Remove the lemon grass stalk and turn up the heat. Simmer until the sauce is thick and the oil begins to separate. The meat may begin to stick so keep your eye on it. The meat should be tender with a thick glossy coating of sauce. Sprinkle with roughly chopped peanuts and serve with rice and cucumber slices.